The American Mindfulness Research Association (AMRA) is a comprehensive electronic resource and publications database available at https://goamra.org. The database is searchable and updated monthly. It’s the brain child of USC researcher David Black. The Bangor and Exeter Group has developed 6 main domains for different levels of competence in teaching mindfulness. Using simple stretches with students can help them to feel the body more in the following quiet meditation, which in turn will often make it easier to actually stay present with body sensations. Keep the poses simple and give clear instructions and demonstrate as in this handout, CHAIR YOGA . Give students full permission to skip poses they are not sure they can or should do and offer variations. If in doubt, don’t do it. Always err on the side of safety. You can also find a simple and easy to adapt sequence of chair yoga poses here. On the page you can find a downloadable handout with the poses, too. Siegel, R. (2010). The Mindfulness Solution. Everyday Practices for Everyday Problems. Guilford. Kabat-Zinn, J. (1994). Wherever You Go, There You Are: Mindfulness Meditation in Everyday Life. Hyperion. Stahl, B., & Goldstein, E. (2010). A Mindfulness-Based Stress Reduction Workbook. New Harbinger Publications. Williams, M., Teasdale J., Segal Z. & Kabat-Zinn J. (2007) The Mindful Way Through Depression. Freeing Yourself from Chronic Unhappiness. Guilford. Bowen, S., Chawla, N., & Marlatt, G. A. (2010). Mindfulness-Based Relapse Prevention for Addictive Behaviors: A clinician’s Guide. Guilford Press. Orsillo, S. M., & Roemer, L. (2011). The Mindful Way Through Anxiety: Break Free from Chronic Worry and Reclaim Your Life. Guilford Press. McCown, D., Reibel, D., & Micozzi, M. S. (2011). 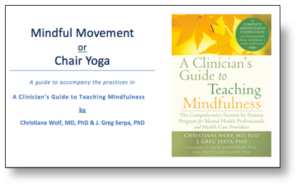 Teaching Mindfulness: A Practical Guide for Clinicians and Educators. New York: Springer. Germer, C. K. (2009). The Mindful Path to Self-Compassion: Freeing Yourself From Destructive Thoughts and Emotions. Guilford Press. Neff, K. (2011). Self-Compassion: Stop Beating Yourself Up and Leave Insecurity Behind. HarperCollins. Salzberg, S. (2004). Lovingkindness: The Revolutionary Art of Happiness. Shambhala Publications. Salzberg, S. (2010). Real happiness: The Power of Meditation: A 28-day Program. Workman Publishing. Sapolsky, R. M. (2004). Why Zebras Don’t Get Ulcers: The Acclaimed Guide to Stress, Stress-related Diseases, and Coping-Now Revised and Updated. Macmillan. Rothschild, B. (2010). 8 Keys to Safe Trauma Recovery: Take-Charge Strategies to Empower Your Healing (8 Keys to Mental Health). WW Norton & Company. Van der Kolk, B (2014). The Body Keeps the Score. Viking. Gardner-Nix, J. (2009). The Mindfulness Solution to Pain: Step-by-Step Techniques for Chronic Pain Management. New Harbinger Publications. Burch, V. (2010). Living Well with Pain and Illness: The Mindful Way to Free Yourself from Suffering. Sounds True. Kabat-Zinn, M., & Kabat-Zinn, J. (1998). Everyday blessings: The Inner Work of Mindful Parenting. Hyperion. Greenland, S. K. (2010). The Mindful Child: How to Help Your Kid Manage Stress and Become Happier, Kinder, and More Compassionate. Simon and Schuster. Casarjian, B. E., & Dillon, D. H. (2007). Mommy Mantras: Affirmations and Insights to Keep You from Losing Your Mind. Random House LLC. Against the Stream. Buddhist Meditation Society. Centers in Los Angeles, San Francisco and other US cities under the guidance of Noah Levine. Strong focus on recovery. Cloud Mountain. Offers residential silent retreats in the Vipassana (insight) tradition. Dhamma Vadhana. Southern California Vipassana Center in the S.N. Goenka tradition. Offers 10 day silent retreats, donation based. Strict.